Breakthrough Drug Low Dose Naltrexone (LDN) LDNscience has arrived! LDN therapies. A MedInsight Research Institute project. 2010 Two studies show LDN benefits. The LDN study from Penn State, and the human trial of LDN at UCSF. Thank you fellow LDNers for funding 50% of the UCSF trial! The organizers of International LDN Awareness Week have launched LDNAware, gateway to worldwide LDN groups, information and activism. He supports supports the UK LDN petition! The off-label protocol referred to as Low Dose Naltrexone (LDN) modulates the immune system and promotes healing. Relying on clinical trial results and interviews with the leading LDN researchers worldwide, we describe the history of LDN and explain its biochemical and molecular effects. In clinical trials, LDN has been shown to halt disease progression in Crohn’s disease and certain cancers, including pancreatic cancer, and to reduce symptoms in multiple sclerosis (MS) and autism. Ongoing trials are evaluating LDN in fibromyalgia and HIV/AIDS. Anecdotally, LDN has been shown to improve almost every autoimmune and neurodegenerative condition, including Parkinson’s disease and amyotrophic lateral sclerosis (ALS). A BIG thank you to Elaine Moore for making this book a reality. She is an extensively published medical author. This book will be an invaluable reference for researchers, practitioners and patients who want to understand the therapeutic potential of LDN. Sign SammyJo's guestbook to be notified of LDN research updates. My name is SammyJo, I'm an MS patient who has experienced remarkable recovery from MS misery. Research is proving that using a low dose of the FDA approved drug Naltrexone is helpful in treating many immune system disorders. LDNers.org is dedicated to helping patients get better with LDN. Meet the LDN Advocates! Vicki Finlayson walked 53 miles for LDN research! 4th Annual LDN Conference and interview videos. Radio interviews with Elaine Moore & SammyJo Wilkinson, authors of the The Promise Of Low Dose Naltrexone Therapy. Follow these links to listen live on the Web or to the show archive. Health Talk with Dr. Ronald Hoffman-September 23,2009 -Listen Now Sept. 2009 Interview with Elaine A. Moore. Wide World of Health Host Cary Nosler - AM Talk 650 KSTE Sacramento. < Click this arrow to listen now or download podcast. Wellness TalkRadio Host Kris Costello - AM 1440 Santa Barbara. Could This Powerful Breakthrough Beat Cancer and Auto-Immune Diseases? New! LDN Patient Tracking Database for all diseases. Post your results! MS survey matches SammyJo's 2004 survey for comparison. This is no longer "just anecdotes" - this is Patient Based Evidence! Dec 20, Dr. Agrawal adds some further thoughts to the his hypothesis on LDN for MS, published in 2005. And comments on the new LDN book, for which he wrote the foreward. Nov 26, Brown N, Panksepp J., Medical Hypotheses. Overview of current trials and theories on how LDN benefits a wide variety of illnesses. Abstract. Sept 22nd, Elaine Moore reports on the important MS/LDN studies at Penn State and University of California. Sept 18th, Maija Haavisto reports on the Italian human trial 6 month report. Wonder Drug: LDN has potential to help tens-of-thousands of patients with diseases like Crohn's, multiple sclerosis, Lupus, parkinson's and even HIV. 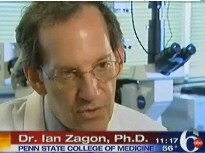 (News interviews with Dr. Ian Zagon and Dr. Jill Smith, LDN researchers at Penn State) Print version to show your doctor. GO VICKI !!! Oct. 21st 2009: Vicki will be back on the Sacramento Capitol steps. Four Lifesaving Medical Treatments: Not So "Anecdotal," After All! Review of little known but effective medical protocols, including LDN. It has been given to the Univ. CA San Francisco MS Research Center. A crossover study to evaluated the effect of LDN on MS has been completed on 80 patients with MS, to be published Spring '08. Show your Dr this study! Thank you to individual contributors and those who put on fundraising events! "An Evening at Lake of the Pines"
-and get updates on Sierra's quest ! I started this site in the Spring of 2004 to confirm that others were seeing the same positive results I was. Thank you to the hundreds of LDNers contributing their experiences. I hope scientific research will accelerate and determine why so many of us are experiencing positive results. Change in EDSS disability score before & after LDN is measured by Survey 2. Follow the Surveys link for result details. The surveys are comprised of a representative sampling of all types of MS (RRMS, SPMS, PPMS). This is important information from patients on the frontlines, and must be followed up by clinical researchers. Naltrexone is an FDA-approved drug. LDN is an off-label use of naltrexone in a low dosage. It does requires a prescription from a doctor. See Resources for help finding a prescriber or pharmacy, and info on LDN for other autoimmune disorders, cancer or HIV. "Never doubt that a small group of thoughtful committed citizens can change the world; indeed, it’s the only thing that ever has." My Story | Surveys | Resources | Research | Advocates | Media Reports | MS Recovery | Cause of MS?